Wow! Now this is a movie! This is in my opinion the greatest surprise of the year. And what is sad is that it somehow came and went from the theaters rather quickly. There are many people, I'm sure, who may have missed out on this MUST-SEE! It seems that Jeff Bridges hasn't really been in the spotlight much as of late. However, he shows us with his performance in Arlington Road that he is a superb actor. His fear and paranoia are transmitted directly to the audience as we experience his horror. 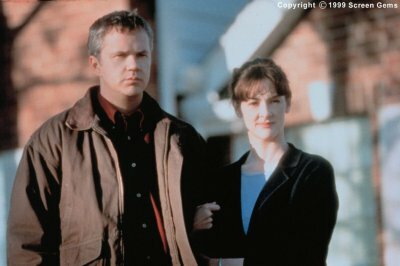 And Tim Robbins and Joan Cusak (below) are great in their roles as well. You are never quite sure if they can be trusted. They also have a looming sense of eeriness to them as well. But the acting (great as it is) is not what makes this movie what it is. It is the story. The whole concept of the film is almost too horrible to imagine: your neighbors could be terrorists. The questions that are raised, particularly on trust, paranoia, and privacy, really seemed to hit home to me; futhermore, they bring up great discussion pieces for you and your friends. Another great theme was harvested from the movie by my friend Steve who pointed out that sometimes the worst thing you can do is to react normally to a given situation. And the way that the movie looks at certain situations is completely enthralling and eye-opening (for those who have seen it, I refer in particular to the scene where the FBI and the backwoods family shoot it out). But what really stands out in my mind (and yours, I am sure, if you have seen it) is the ending. This movie has THE BEST ENDING of any movie of its kind that I have ever seen. There is another aspect of the film which is quite riveting. I don't know quite how to term it, but I would call it a mixture of the cinematography and the "feel" of the movie. It can get quite unorthodox and artistic at times in both the visual and the sound effects. It really is neat how they do it and it affects ones emotions immediately. However, seeing this on TV may not have the same effect. It really should be seen in the theater. Unfortunately, there is a small scene which robs from this movie its potential perfection. Taking away from the movie's realism is the attempt to make pictures from an old high-school album appear shocking and scary. What I am referring to are some particular pictures of Oliver Lang (the neighbor) where he is staring out from the pages with this look of hate and death on his face. No high school in the country would have put pictures like that into their album. It was completely ridiculous. However, it was just this one scene that really didn't quite belong; the rest of the movie is great. So don't let that stop you from seeing one of the best movies of the year. You simply must see this film. Don't let it pass you by. How would you rate the movie Arlington Road? There have been 7607 people to visit this page since Tue, Jul 27, 1999. And you are the first person to visit this page today!